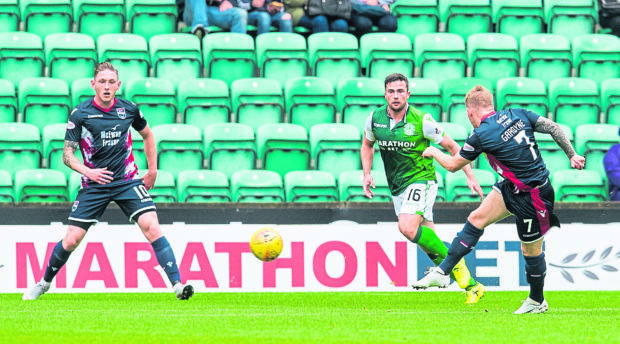 Ross County saw a Betfred Cup quarter-final tie against Aberdeen slip from their grasp as they twice squandered the lead against Hibernian before suffering late heartbreak. The Staggies had led twice at Easter Road against their Premiership opponents, with goals from Michael Gardyne and a Josh Mullin penalty. On both occasions it was relinquished quickly, with David Gray and Stevie Mallan restoring parity. With the match looking destined for extra time, Hibs winger Daryl Horgan struck in stoppage time to inflict a painful defeat for the Highlanders. However there were areas of encouragement for co-managers Stuart Kettlewell and Steven Ferguson. This was County’s first meeting with top-flight opposition since their relegation to the Championship last season, but for large spells they looked more than comfortable facing Premiership opposition. County were back in the capital for the second time in six days, having defeated Hearts colts 2-1 in the IRN-BRU Cup at Tynecastle in midweek. Kettlewell and Ferguson had named a much-changed side on that occasion, but they restored the team which defeated Dunfermline 3-1 on Championship duty the previous weekend, with new signing Don Cowie starting on the bench. Hibs were fresh from Europa League action, having exited the competition following a 3-0 reverse to Molde in Norway on Thursday, with Neil Lennon making six changes. Although County got the game off to a brazen start, with Iain Vigurs booked within the opening six seconds for a lunge on Stevie Mallan, the Staggies looked comfortable in possession from the start, taking the lead on 10 minutes. Josh Mullin’s corner was only partially cleared by Efe Ambrose, landing at the feet of Gardyne on the edge of the box, and his first-time shot wrongfooted Ross Laidlaw with the aid of a deflection. It was a bright start from the Staggies, but it appeared to serve as a wake up call for the hosts. Martin Boyle was the first to threaten with a low drive from the edge of the box, which Scott Fox did well to turn around the post, however Hibs’ breakthrough did arrive on the quarter-hour mark. It was all too simple, with Daryl Horgan’s cross picking out right back Gray inside the box, who rose above Watson to plant a header low past Fox. Boosted by their quick leveller, Hibs hit the front foot. Boyle was denied by a superb block by the legs of Fox, after the winger broke clear of Marcus Fraser, before Fox thwarted Boyle for a third time from another low effort on 21 minutes. County’s attacking threat had become limited, with Ross Draper nodding Kelly’s free-kick well wide. The visitors made a fine start to the second half however, with an outstanding fingertip save from Laidlaw required to thwart Vigurs’ free kick on 52 minutes. County were dealt a blow on 55 minutes when Jamie Lindsay was stretchered off following a collision in the Hibs box, which meant a return to Staggies colours for Cowie, 11 years after he made the switch to Caley Thistle. County were handed the ideal chance to regain their advantage on 62 minutes, when a moment of clumsiness by Ambrose allowed Declan McManus to rob him of possession before the Nigerian defender brought the Staggies attacker down, with Kevin Clancy eventually pointing to the spot following several seconds of deliberation. Mullin took on the responsibility, blasting the ball low into Laidlaw’s right corner. The Dingwall men could have wrapped up their victory, with Laidlaw making two saves in quick succession to deny Gardyne and Kelly, however as with the opener, County were not able to keep their back door shut. This time it was Mallan who did the damage with a dipping low effort. The decisive moment came in the first minute of stoppage time, with Horgan curling a strike past Fox from long range to secure a home tie with the Dons. Hibernian (4-3-3) – Laidlaw 7, Gray 6, Horgan 8 (Hanlon 90), Boyle 7, Mallan 7, Stevenson 6, Hyndman 5, Ambrose 5, Martin 5 (Whittaker 46), Shaw 6, Porteous 6. Subs not used – Dabrowski, Slivka, Swanson, Agyepong. Ross County (4-3-3 ) – Fox 6, Fraser 6 (Demetriou 73), Kelly 6, Morris 6, Draper 6, Gardyne 7, Lindsay 6 (Cowie 55), McManus 7 (Graham 84), Vigurs 7, Mullin 6, Watson 6. Subs not used – Munro, Mckay, Keillor-Dunn, T. Dingwall.